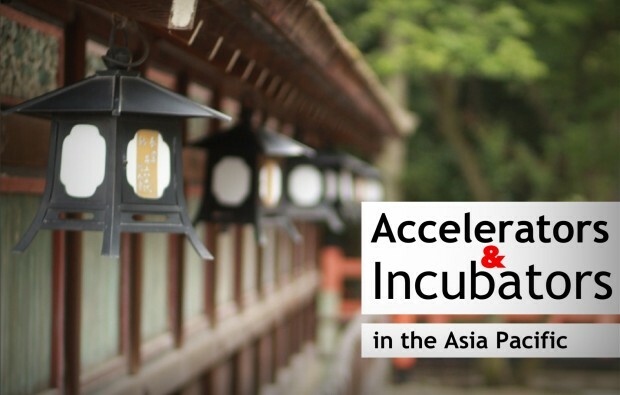 Over on our Japanese site, my colleague Takuya has put together a very informative list of incubators and accelerators from around the Asia region. This follows his previous list of Japanese seed accelerators and VC firms, which I encourage you to check out as well. We thought that since there aren’t many places online where you can find such information all in one place, it might be a good idea to publish it here too. So with that, I present to you the list below, which despite its size is not meant to be totally comprehensive — so we welcome any suggestions for places we might have missed in the comments . Startmate (Australia): This accelerator has a five-month program that includes a trip to Silicon Valley. Ignition Labs (Australia): A three month program that focuses on clean tech. Pollenizer (Australia): Offers funding via Pollenizer Ventures, and menturing from the founders and others. PushStart (Australia): A three-month program. Incubated startups receive some funding as well as office space and mentorship. Venture Incubator Space (Australia): A one-year incubation period, subsidized working space. BlueChilli (Australia): This incubator has presences in Sydney and Melbourne. Angel Cube Melb (Australia): Based in Melbourne, this three month intensive incubator accepts four teams, awarding $20,000 to each one. York Butter Factory (Australia): Focused on digital media. It also provides co-working space. Gen Innovation Australia (GENIAUS) (Australia): Focused on interactive media and digital art. Mentoring is peer-based, with assistance from experienced entrepreneurs. iLab (Australia): A paid incubator for early stage companies. Brisbane Technology Park (Australia): Provides access to business mentors and VCs. Gold Coast Innovation Centre (Australia): Focuses on early stage startups with mentorship provided. Innovation Centre (Australia): Focused on things like clean tech, health, and creative. Startup Tasmania (Australia): Focuses on fast-growth startups. There is a co-working space that also provides networking opportuities to meet investors. Innovyz (Australia): Offers a 12-week accellerator program, which includes cash, mentoring, and more. iCentre Brunei (Brunei): Focuses on ICT startups, and provides mentorship and networking. EME Business Incubator (Cambodia): Mentors high-potential entrepreneurs in the country. Axlr8r (China): Established in 2010, helping companies improve their products for US and Chinese markets. Innovation Works (China): Established by Kaifu Lee back in 2009. The Innovation Works Development Fund is an early stage development fund co-managed with WI Harper Group. HAXLR8R (China): HAXLR8R is a seed program that offers mentorship for international hardware startups. SOFTLAYER CATALYST (Hong Kong): This virtual incubator from SoftLayer helps startups with hosting, development and support. It is based in Hong Kong, but covers all of the Asia Pacific region. NEST (Hong Kong): Holds monthly pitch days, and startups receive office space, some funding, and mentoring. StartupsHK.com (Hong Kong): Non-profit startup community. AcceleratorHK (Hong Kong): Provides co-working space and mentorship. It is run by entrepreneurs Stephen Forte and Paul Orlando. The Morpheus (India): Focused on early stage startups, and incubates companies for four months. T-Labs (India): Operated by Times Internet Limited, provides mentorship from entrepreneurs and angel investors. The Startup Centre (India): Has a resident program as well as an accelerator program. Microsoft Accelerator India (India): This program runs for four months, and brings in new batches in May and November. iAccelerator (India): Targets mobile and internet startups, providing them with capital as well as mentoring, networking opportunities, and a demo day. VentureNursery (India): Runs for 13 weeks with 8 startups selected, and is held twice a year. GSF India (India): This Delhi-based accelerator is actually a multi-city effort with presences in Mumbai and Bangalore as well. It is led by Rajeshi Sawhney, the former president of Reliance Entertainment. The Hatch (India): Has physical and virtual programs for startups. The incubator program runs for 52 weeks; accelerator for 13 weeks. INFUSE Ventures (India): Focuses on startups doing work in the areas of sustainable energy and clean tech. Has a partnership with the Indian government. Gemini New Media Ventures (India): Offers startups assistance with their business strategy, helping them grow to a sustainable state. Rural Technology & Business Incubator (India): Funded by both the World Bank’s InfoDev Project as well as DST. It has a rural focus. Society for Innovation and Entrepreneurship(SINE), IIT Bombay (India): Focuses on entrepreneurial research, with financial assistance coming from DST. New Ventures India (India): This Indian incubator targets the ‘green business’ space. Technopark TBI (India): A joint initiative between Technopark and the DST. IIIT-Bangalore Innovation Centre (India): Targets seed-stage startups, providing support in the form of a work space and consultation. Startup Village (India): Supports student entrepreneurs in the Kerala region. 5ideas (India): Founded by Pearl Uppal and Gaurav Kachru, and aims to support entrepreneurship among women. MyfirstCheque (India): Invests in local startups, and provides mentorship. It is organized by a group of experienced entrepreneurs. Indian Angel Network Incubator (India): Supported by the National Science and Technology Entrepreneurship Development Board, the Department of Science and Technology, and the government of India. Technology Business Incubator, IIT Delhi (India): Accepting proposals by students, academic staff, or alumni. Veddis (India): Offers office space, insfrastructure, and support to startups. Investments range from $250,000 to $10M. Khosla Labs (India): Run by Srikanth Nadhamuni, the head of technology at the Unique Identificantion Authority of India. MerahPutih (Indonesia): Provides working space and capital to early to mid-stage startups. investidea (Indonesia): Focused on early stage tech/web startups, providing funding, advice, and other support. Bandung Ventures (Indonesia): Bandung Ventures makes seed-stage investments in the Bandung region. Raja Capital (Indonesia): VC that focuses on tech startups in the seed/early/growth stages. Ideosource (Indonesia): Run by Andi S. Boediman, focusing on see investment. It launched in June of 2011. Project Eden (Indonesia): Claiming to be Indonesia’s first startup accelerator, this one is supported by Jardintech Capital. Batavia Incubator ( Indonesia): Joint venture run by Takeshi Ebihara, who is very experienced in the tech startup scene. SparkLabs (Korea): An accelerator focused on tech companies, with mentorship, office space, and advisors available. Strong Ventures (Korea): Targets young entrepreneurs and startups in the seed stage. KStartup (Korea): KStartup operates under AppCenter, and is a partner with Google for Entrepreneurs. Primer (Korea): Initiated by Primer Group, and headed by by CEO Douglas Guen. IgniteSpark (Korea): This incubator/accelerator is led by David Choi. Fast Track Asia (Korea): Initiated by same investors who backed TickerMonster. TJ Heaven(Startup Party) (Korea): Focuses primarily on mentoring for young startups, and is led by Gyumin Cho. Founders Camp (Korea): This accelerator is led by Heeseung Kang. Grey Attic (Malasya): Aspires to create new businesses and match them with business opportunities. It provides them with valable mentoring along the way. Update: We’re told this isn’t active these days. MAD Incubator (Malaysia): Makes assistance and incubation affordable to most entrepreneurs via its MAD programs. MVP’s Incubator (Philippines): Supported by a wide range of business interests. Launchgarage (Philippines): Early stage funding program supported by Globe Telecom. IdeaSpace (Philippines): Incubator and accelerator that aims to support entrepreneurship in the Philippines. Kickstart (Philippines): Began in March of 2012 to support tech entrepreneurship in the Philippines. Seed Accelerator (Singapore (AUS)): An early stage VC/incubator targeting startups in Sydney and Singapore. Azione Capital (Singapore): This seed stage VC focuses on digital media and mobile communications. Jungle Ventures (Singapore): Focuses on seed and Series A investments in the Asia Pacific region. IncuVest (Singapore): Focuses on mentoring young startup companies in the information technology space. TNF Ventures (Singapore): Includes many established individuals in the tech community, highly experienced in founding and mentoring young startups. Red Dot Ventures (Singapore): Operated by entrepreneur Leslie Loh. It provides support in the form of financing, mentoring, etc. Get2Volume Accelerator (Singapore): Focused on building companies in the microelectronics and semiconductor industries. The Biofactory (Singapore): This incubator creates biomedical companies. WaveMaker Labs (Singapore): Focuses on digital media and tech startups. Clearbridge Accelerator (Singapore): Clearbridge Partner’s incubator arm, comprised of Singaporean tech entrepreneurs and scientists. I2G Tech Accelerator (Singapore): Accelerator focused on clean energy, wireless, and medical technologies for B2B. Neoteny Labs Silicon Straits (Singapore): Early stage incubator founded by Joichi Ito. Plug and Play Singapore (Singapore): Established in 2006, invests in high tech startups. Social Slingshot (Singapore): Founded by MySpace.com founder Brad Greenspan, invests in social, mobile, clean tech. Small World Group (Singapore): Focused on clean tech and optical systems. Stream Global (Singapore): Venture ‘catalyst’ for tech startups. TechCube8 (Singapore): Private technology investor and incubator to promote entrepreneurship and high tech R&D. Gobi Partners (Singapore): Early stage VC firm for IT and digital media in China. JFDI.Asia (Singapore): Seed accelerator focusing on mobile and digital products for Asia. Expara (Singapore): Established in 2003, it invests in and nurtures entrepreneurs, mostly in the interactive and digital media spaces. Base@muvee (Singapore): An incubator and a co-working space. Founder Institute Singapore (Singapore): A four month training program for entrepreneurs in a range of industries. I.JAM INCUBATOR (Singapore): Supports startups with great ideas that can be developed into products and services. NUS Enterprise Incubator (Singapore): For both early and late stage startups, providing advice, mentoring, facilities and more. Crystal Horse Investment (Singapore): Primarily involved in angel investments, also providing advice, support, funding and expertise. Ruvento Ventures (Singapore): Manages RUVENTO’s venture funds. Focuses on incubating companies in Singapore, then giving them market access to Asia Pacifc and Greater China. NTU Ventures (Singapore): A greenlane incubator for a number of grant schemes. Singapore infocomm Technology Federation (SiTF) (Singapore): Works with many plaers in ICT, focusing on things like digital media, cloud computing, etc. QuestAccelerator (Singapore): Team is made up of people experienced in the Chinese market. Fatfish MediaLab (Singapore): Focused on mobile and social media apps. FocusTech Ventures (Singapore): Focused on hardware startups and manufacturing technologies. Angels Gate Advisory (Singapore): Manages the incubation of companies from the Angels Gate platform. PARCO next NEXT (Singapore): A fashion incubator that selects fashion designers for an 18-month training program. East Ventures (Singapore): First investments company for tech startups in Indonesia. Appworks Venture (Taiwan): Focses in Chinese internet and mobile phone applications, founded in 2009. YSeed (Taiwan): Incubation program from Yushan Ventures, supporting startups by helping them with user acquisition, funding, and internationalization. M8VC (Thailand): Offers an accelerator program with seed funding, offices space, and mentorship. AIS (Thailand): A top startup incubator in Thailand. NSTDA BIC (Thailand): Thailand’s national business incubator supporting entrepreneurs. 5Desire (Vietnam): Incubator and conssulting firm focused on various sectors. FICO by FPT (Vietnam): This incubator primarily targets students. Topica Founder’s Institute (Vietnam): This is a 15-week program for leaders from successful startups. In case you’d like to dig further, here are the places from which we gathered most of this info. These are all quality resources and we encourage you to check them out.